Charlotte, NC – Walking into the new NASCAR Hall of Fame is a bit like strolling into living history. The modern, gleaming facility in the midst of downtown Charlotte’s skyscrapers officially opens next week. But a handful of fortunate media members were invited to a preview on Tuesday – kind of like a play’s dress rehearsal. If it was a play, there would have been plenty of curtain calls and cries of “Bravo’’ at the end. The place is spectacular. Rabid NASCAR followers and casual fans alike will find plenty to enjoy in the new building, starting with the 12-minute movie that greets the visitors in a sumptuous theater on the first level of the multistory building. The film gives a pretty basic overview of the history of the stock car sport on a wraparound screen. A tip from a first-time visitor: Sit up as high as you can so that the images on the three-segment screen are easier to follow. 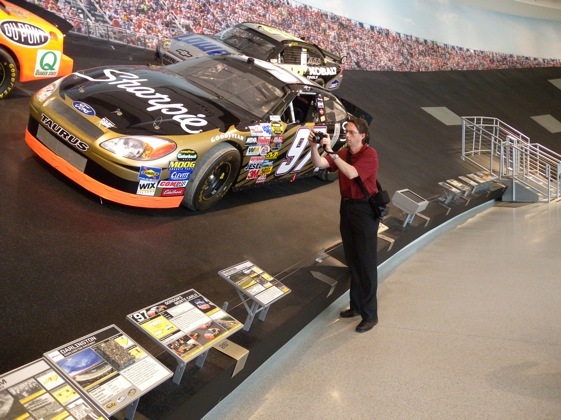 The next part of the trip that eventually takes you to the third floor of the building is a winding walkway called Glory Road that follows the growth of NASCAR from its beginnings in the late 40s to current times. As you walk up the easy incline and look at a series of cars, beginning with a 1939 Ford Coup fielded by Raymond Parks and driven by Red Byron, you’ll also note that the platform on which the vehicles rest steadily increases in steepness, corresponding to the banking of the racetracks that are shown on accompanying signs. At the top is the 33-degree banking of Talladega, almost as steep as the side of a four-story building. On the next level is the Hall of Honor, where in a couple of weeks, the inaugural Hall of Fame class, including Bill France Sr., Bill France Jr., Richard Petty, Dale Earnhardt and Junior Johnson, will be enshrined. The rotunda-like room includes spaces for cars representing the honored drivers and big overhead screens that give some background on each of the enrhinees, one at a time. And there’s plenty of room for the classes to come. Just outside the Hall of Honor are several more galleries, including one in which one can walk through a full-size hauler, get some insight into parts and pieces and planning that crew chiefs, engineers and mechanics deal with every day and, if you’re so inclined, sit down and run a few timed laps on a machine or in a full-fledged in-car simulator. Finally, there is the top floor, which includes a series of galleries honoring everyone from the pioneers of the sport to the journalists who have covered it from the beginning. The glass cases are chock full of memorabilia, lovingly collected over the past two years by HOF historian Buz McKim and his staff. McKim, who continues his search for more treasures, said the exhibits will continue adding memorabilia and information and will be constantly changing to keep the place fresh for return visits. Also on the top floor, there is also a gallery dedicated to the improvements in safety in the stock car sport in recent years. Surprisingly, and properly, it even includes a copy of the book-like official report on the Feb. 2001 accident in which Dale Earnhardt was killed at Daytona – a terrible event that was a catalyst to the safety movement. In the midst of that is a full-sized cutaway display of a Car of Tomorrow. From bottom-to-top, the place is full of interactive screens that are turned on by inserting your credential _ a NASCAR Hall of Fame Hard Card that comes with the price of admission. These displays include close finishes, wild crashes, trivia quizzes and much more. The Hall of Fame will be a delight for fans of just about any age and, the best part, is there’s plenty of room for future expansion. Hall of Fame director Winston Kelly and his staff have a lot be proud of – and the place hasn’t even opened yet. Without David Pearson in the 1st group it becomes the Hall of Shame. There’s nothing to be proud of in this monument to the egotism of the France family.